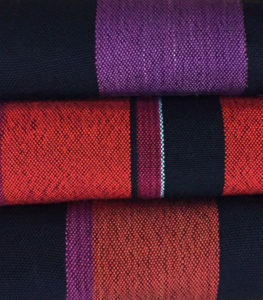 WEAVING is a method of textile production in which two distinct sets of yarns or threads are interlaced at right angles to form cloth and accomplished on a loom, a device that holds the warp threads in place while filling threads are woven through them. The way the warp (longitudinal threads) and filling threads (weft) interlace with each other on a loom is called the weave from the Old English wefan “to weave, form by interlacing yarn, figuratively devise, contrive, arrange;” from Proto-Germanic weban (source also of Old Norse vefa, Middle Low German, Middle Dutch, Dutch weven, Old High German weban, German weben “to weave”); also “to move quickly” (source also of Sanskrit ūrṇavābhi “spider,” Persian baftan “to weave,” Greek hyphe, hyphos “web,” Old English webb “web”). DYEING is the application of dyes on textiles with the objective of achieving color with desired fastness. Dyeing is normally done in a special solution containing dyes and particular chemical material (vinegar and sodium chloride or salt). Dye molecules are fixed to the fiber by absorption with temperature and time being key controlling factors. Artificial dyes achieve a broader range of colors and are more stable than natural dyes. Different classes of dyes are used for different types of fiber and at different stages of the textile production process. Acid dyes are used to color silk, a protein fiber. The word dye is from Middle English deie and from Old English dag and dah.